I love sharing my curiosity and enthusiasm for the natural world and pointing out all the beauty that surrounds us. If we stop to really observe our surroundings, we will be forever inspired to create! 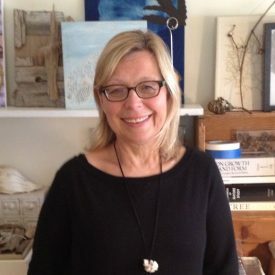 Karen Fuchs is a teaching artist and designer with a background in textile design and interior architecture. She has developed and teaches curriculum that focuses on looking closely at the natural world—its forms, patterns, and structures—and creating art-making projects that are inspired by this scrutiny. She leads talks and workshops on making connections between art, science, design, and the natural and the man-made world. Her work includes cyanotypes, textiles, printmaking, collage, and assemblage.